Kinslayer. Soul reaver. Sorcerer. Thief. And last emperor of a cruel, decadent race. Elric of Melniboné is all of these–and more. His life is sustained by drugs and magic–and energy sucked from the victims of his vampiric black sword, Stormbringer, a weapon feared by men and gods alike. Denied the oblivion he seeks, poised between a tragic past he cannot escape and a terrifying future he is doomed to bring about, Elric is a hero like no other. Gorgeously illustrated by Michael Wm. 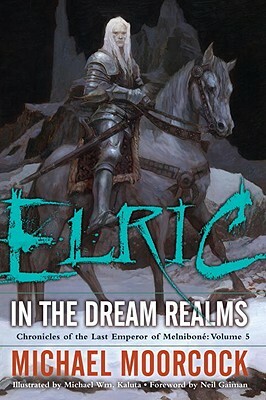 Kaluta, Elric: In the Dream Realms is a dream come true for sword-and-sorcery fans. Michael John Moorcock (born 1939) is a prolific British writer primarily of science fiction and science fantasy who has also published a number of literary novels. His most popular works by far have been the Elric novels. As editor of the controversial British science fiction magazine New Worlds, Moorcock fostered the development of the New Wave in the UK and indirectly in the U.S. He won the Nebula Award for his novella Behold the Man, which tells the story of a time traveler who takes on the role of Christ. He has also won the World Fantasy Award, the British Fantasy Award, and many others, and in 2008 was named a Grand Master by the Science Fiction Writers of America.